I’m quite experienced traveler but I can tell you I have never met such well and carefully organized app apartments. Alll, absolutely all you can dream about is there and it is indeed in excellent conditions! Above the all Octavi waited for us till very late and provided late check out with no extra charge. Bravo Octavi! Super good job! This apartment was fantastic. Central location on the main strip with beach across the road. Everything was provided from toiletries to cooking products. The attention to detail for what a guest needs was excellent. The host was so helpful and even provided a welcome pack with main essentials for breakfast! I would totally 100% recommend this property and it was well worth the money. Octavi is a great host. The apartment was so well laid out with everything taken care of from air conditioning to USB ports and chargers to food and drinks. Amazing attention to detail. I have never stayed in a property that has catered to our needs as extensively as this! There were hairdryers and straighteners, shower gel, shampoo, even sun creams of various factors and after sun. The welcome food pack was a lovely surprise too. Much more than I expected. Outstanding place! I highly recommend it! Everything about this apartment was perfect. Spotlessly clean, great air conditioning, very well kitted out and great location across the road from the beach. Octavi, the owner, was very helpful. Food package with plenty for our breakfast and more was a lovely welcome gesture. Very close to shops restaurants and bars. We had a very comfortable and enjoyable holiday. This apartment has contributed great deal to us bringing back wonderful memories from our holiday. Very nice, open, flexible and extremely punctual owner proving professional-level services. Excellent location just across the street from the sandy beach with easy connections to shops and city center, nevertheless very quiet in the evenings and at night time. Perfectly equipped kitchen, two separate terraces on the corner sides of the building, cosy living area, air-conditioners in all rooms, very comfortable bed rooms - overall great value for money - well done Octavi ! The apartment was extremely clean and very well equipped. We were very impressed by the quality of bedding, towels, and kitchen supplies. It all looked brand new! Upon arrival we were pleasantly surprised to see a starter supply of food in the kitchen. Octavi is an amazing host and very helpful. I asked him if there was a blender in the kitchen to make smoothies and since there wasn't one, he had one delivered to the unit in 2 days! He answered the phone every time I called. We stayed in the apartment for two weeks and felt very much at home. The balcony, with a partial ocean view, had many plants and a nice table and chairs where we enjoyed our breakfast every morning. Lock in a great price for L'Eixideta – rated 9.7 by recent guests! Located 2 minutes' walk from Levante Beach, L'Eixideta offers family-friendly accommodations in Salou. This apartment features a shared seasonal outdoor pool and free WiFi. Private parking is available on site. 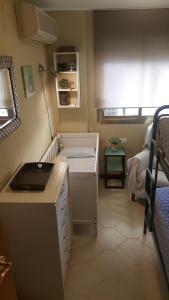 This bright apartment comes with 1 twin room and 1 room with bunk beds for 2 people. The kitchen includes a dishwasher and oven. A flat-screen TV is provided. Other facilities at L'Eixideta include a sun terrace. Bed linen and towels are provided. The accommodations is fully equipped for the winter period, offering heating, duvets and blankets. PortAventura is 3.7 mi away and the nearest airport is Reus Airport, 7.5 mi from L'Eixideta. 뀐 Located in the real heart of Salou, this property has an excellent location score of 9.8! When would you like to stay at L'Eixideta? This apartment comes with 1 twin bedroom and 1 bedroom with 2 bunk beds; and a bathroom completed with a hairdryer and hair straightener. There is a fully equipped kitchen, a smart TV, a washing machine and dryer. Incredible 65m2 apartment on the seafront, just 3 minutes walk from Playa de Levante, in the very center of Passeig Jaume I, in Salou, renovated in 2015 with a large terrace overlooking the sea.Large dining room with two couches, a large dining table and fully equipped kitchen with all utensils and appliances for cooking. 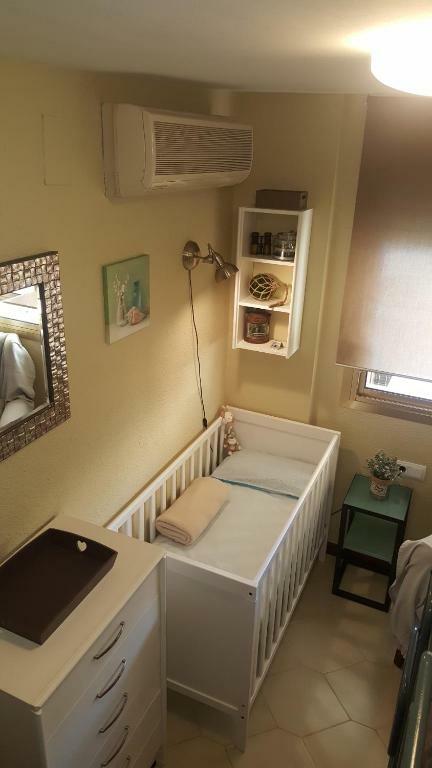 Available two bedrooms, one double with two single beds and a the other with a single bunk.Baby cot free of charge and extra bed for children under 12 years old. Located on a fourth floor with a lift, facilities include air conditioning, Wi-Fi, Led TV 32 " with Smart-TV, fridge and private bathroom.It has another terrace with direct access from the double room.The apartment is all outside with plenty of light, fully equipped and has all the bedding, bath linen and table linen necessary for your stay. Communal pool with lifeguard and sunbathing area.Private parking to pay. 24h Surveillance and 24h Reception.No pets allowed and Smoking is not allowed.Preferably designed for family tourism, therefore people under 25 years old are not allowed, except when accompanied by two adults older than 30 years old. We are not an agency nor do we link to other apartments in the same complex Novelty. Our apartment is unique in the entire complex and is specially created and designed to offer high-standard accommodation.The apartment is in operation since 2016..Great pedestrian zone. Very close to all services. Bus Station 5 minutes walk. Train Station 10 minutes walk. Taxi Rank: 400 meters. Station Camp de Tarragona AVE is located at 17km and Reus Airport at 8km from the apartment. These stations have regular bus lines that can take you to Salou, which stops are 5 minutes walk to the apartment.Port Aventura is located 1.8km, but it can be reached by: regular bus, the tourist train of Salou or taxi. It can also be reached on foot in 25 minutes.Very close to the apartment you can find car, motorcycle and bicycle rental services. We propose a series of activities to do with family or friends and combine it with your beach vacation. Our goal is to present the most unkown environment inside the Costa Daurada by the majority in order to discover the cultural, landscape and natural heritage of this magnificent place and promote outdoors activities.See our blog in our website L'Eixideta. 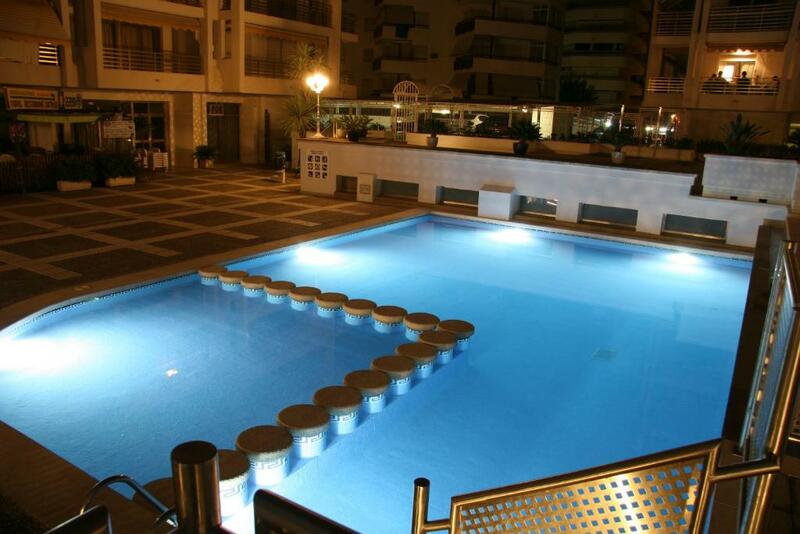 Thanks to its excellent location you can walk to all the beaches of Salou and the historic center of the town, as well as all the shopping and nightlife.The apartment is located in a particularly quiet area, given the nature of the town and taking into account the amount of tourism in summer. Very close to the apartment you can find car rental services, motorcycles and bicycles. House Rules L'Eixideta takes special requests – add in the next step! L&#39;Eixideta accepts these cards and reserves the right to temporarily hold an amount prior to arrival. L'Eixideta accepts these cards and reserves the right to temporarily hold an amount prior to arrival. Please note that the parking is available on prior request, subject to availability. Please note that the pool is open from 1st of June until 15th of September. Please note that for bookings between June 15 and September 15 there is a refundable security deposit of EUR 350 to be paid in cash or credit card upon arrival. Please note that parties and excessive noise are strictly prohibited at the property. Please inform L'Eixideta of your expected arrival time in advance. You can use the Special Requests box when booking, or contact the property directly using the contact details in your confirmation. I have nothing negative to say except very few english channels on tv. The only thing I don’t like is that there aren’t more properties like this. Seriously, there is nothing I didn’t like about this place. Very welcoming and had all the requirements we needed. Great location and very relaxing. Nothing that I did not like but just quick clarifications that others may find useful .... the unit is provided in impeccable condition and not serviced during the visit and main bedroom has two single beds that can be pulled together and second room has bunk bed. The WiFi was too slow in the evenings. The TV does not have any channels worth watching, but who wants to waste time watching TV when you can go out and enjoy Salou.